Our Pipettes or plastic droppers are graduated in 1/2 ml increments up to 3ml and can easily dispense 1 drop at a time. We recommend using a separate dropper for each essential oil. Note: our 5ml, 10ml, 15ml and 1oz bottles of essential oils include an orifice reducer, so these plastic droppers are not necessary. 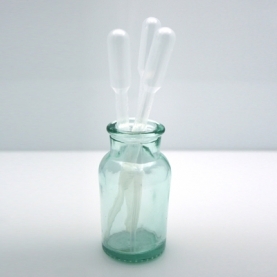 But, for larger sizes (2oz or larger), pipettes can be very handy. We do not recommend the use of glass droppers with a rubber bulb with pure esssential oils. The essential oils causes the rubber to deteriorate rapidly. Our plastic droppers are not impervious to the essential oils but usually last for years, especially if you occasionally clean them with alcohol and let them dry out. Helpful hint: attach each dropper to it's bottle with a rubber band - that way you do not mix your essential oils.